Our driver had a hard time locating the cemetery. Truly, it was not easy to find. When we finally did arrive we met the caretaker who opened up the gate for us. On the way up to the cemetery we purchased flowers and the caretaker gave us yahrzeit candles, which we all lit. Each one of us placed flowers on the memorial. My mother and father were buried in this mass grave with nine other people. They were all shot trying to escape from Bochnia in 1943. A prearranged coal truck with a double decker, could fit 10 people inside by laying on their backs between the coal and the chasse. This truck would then take them to the Polish, Czech and Hungarian borders, where the smugglers would be waiting for them and at night time smuggle them across the border. That was the way my sister, Lola with her husband, Michel first crossed the border with a group of 8 people. A few days later the truck arrived again and the same driver relayed to us the predetermined password which meant that they had crossed successfully. It was time for the second group in which included me, my younger brother and another eight people. We were successful in crossing the same way. The third transport was meant for my parents and 8 additional people. As the truck pulled into the barn at night, the people would enter into the truck belly and in the morning the truck would drive to the border. Only this time a neighboring Polish farmer noticed something and he called the Gestapo. They pulled everyone out of the truck, including the gentile driver and lined them up and shot them all, my parents, the eight other passengers and the driver. The Gestapo brought the Gheto Kapo with them whose job it was to bury the bodies. He then buried all of them in this mass grave in the Bochnia Cemetery. This particular Kapo was a school friend of Michel Lieber and he survived the war. After the war was over he pointed out the gravesite to my sister Lola and Michel. He also knew our parents. After the war was over Lola and I put up a memorial headstone in Bochnia. The cemetery is very old. It was serene and peaceful with many fruit and shade trees and surprisingly very well cared for by this caretaker in charge. At the headstone after placing the flowers, we lit the candles and I made a Kail Moley Rachamim, naming both of my parents. Afterwards we all recited the Kadish. Then I asked the kids if they would not mind if I talked to my parents in their native language (Yiddish), hoping that they will not freak out because none of them speak Yiddish, even though my daughters might have understood a few words here and there. "Dear Mom and Dad, I am your son Benjamin. I am here with my two daughters, Sherry, who is named Sarah in Hebrew after you and Gail, who is named after my sister Goldie. Both of my daughters are happily married and they each have two children. Not every member of our family could travel with me to visit with you, even though they all wished they could, due to circumstances, health reasons and timing. It was very difficult to get them all together at this time. Even my dear wife Jean, who encouraged us to make this trip, was unable to join us due to health reasons. However, here with me is Michael Gerber, Gail’s husband, two of my grandchildren; Robyn is Sherry’s daughter and Adam is Michael & Gail’s son, whose middle name is after you, Father, Loren for Lazar. Michael and Gail have a daughter, Jenica and Sherry another daughter, Cindy, as well as her husband, Larry Kramer. Sherry’s husband could not make the trip and of course, my dear wife Jean could not join us on this trip." 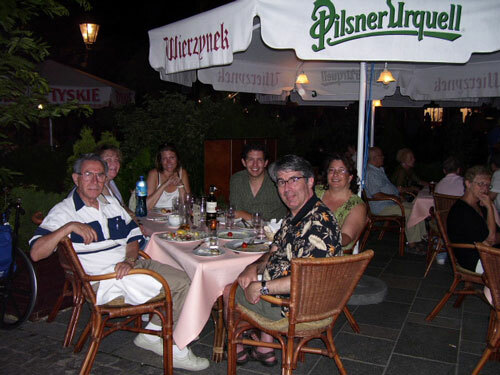 "Mom and Dad, approximately ten years ago Jean and I, as well as your other daughter Lola (Lajcu) along with Lola’s son Heshie and his lovely wife Pessie, were here visiting with you. At that time Jean and I vowed that even though we will always mourn your loss—we would never set foot on this blood soaked soil again. However, when my own grandchildren and my daughters wanted to know where your resting place is, which made me very happy, I was very pleased that they cared enough and asked me to bring them here. How could I refuse? For let’s face facts I am getting on in age and who knows if I will ever be able to visit with you again. However, it feels good to know that your memory will live on through our children and grandchildren forever." "Dear Mom and Dad, I would like to update you about the rest of our immediate family. Although I am sure that you probably know and that you are probably all together somewhere in a better place watching over us. Unfortunately out of 7 of our immediate family, only Lola and I survived the war. Moishe, Goldie and Tuliko did not survive the Holocaust." "My sister Lola lives in New York State. Her husband Michel past away many years ago of natural causes. They had three children who all reside in New York. They all live very happy Orthodox Jewish lives and G-D blessed them with many grandchildren, so kain ayin hora, Lola’s grandchildren along with her great grandchildren now number approximately 39." "My wonderful wife Jean and I live in Las Vegas, Nevada and we live a very happy retired life." "Sherry and her husband Larry, with one daughter, Cindy, live in Staten Island, New York, not very far from Lola. Sherry’s other daughter, Robyn Kramer, who is here with us, lives in Los Angeles, California." "My other daughter, Gail and her husband, Michael and their two children, Adam and Jenica, all live in Los Angeles. Thanks G-D everyone is okay and we are all doing considerably fine. Although some of us have some health issues, mind you none of us are complaining. We thank G-D for every day." "We would all welcome your blessings and your prayers for a long, happy, healthy life. Somehow while I am in front of you, I just know that you will be watching over us." "My dear parents, this is July, 2006. After we have lost approximately six million of our Jewish people, only a small remnant of European Jewry survived the Holocaust. None of us survivors wanted to remain here in these countries where they hate the Jewish people with such passion." "After the war many of the remaining survivors were trying to go to Palestine and hopefully create a Jewish state there, in the land from where we were originally disbursed. It was not an easy task, for every country tried to blockade us from reaching our promised land." "By 1948 – three years after the Holocaust a miracle occurred. They were debating in the United Nations whether Palestine should be allowed to become a Jewish state, and whether the land should be partitioned off, where a portion of it will become a Jewish state. It was as though they realized how the whole world stood by in silence while the Nazis were slaughtering six million of our men, women and children, they knew that if we had our own country to represent the Jewish people, this could have been prevented and instead no one cared, no one in this world shed a tear for us. On that day, the United Nations and the world gave us our homeland – Israel." "I must also tell you that for the last ten years I have dedicated my life to speaking and lecturing in schools, colleges, synagogues, temples, churches and to anyone who will listen about the indescribable atrocities committed by Nazi Germany and their willing accomplices, while the free world stood passively by in silence. I feel that I am running a race against time and that I must give my testimony to as many people who are willing to listen, not just for the present but also for the future. I feel that it is my moral obligation to tell and retell this tragic saga of the Holocaust in order to keep this world from contracting amnesia." "I am of the opinion that it was you, your neshumes, your spirits that were there that day in the United Nations fighting for us. I am of the strong belief that you instilled a guilt feeling into the delegates, or perhaps it was even remorse, but whatever you want to call it, I credit you for making the majority of delegates vote yes for the creation of a Jewish Homeland, so that out of the ashes, Israel was born." "Israel is now 58 years old and Jerusalem is its capital. Hebrew is Israel’s official language. We have a white flag with blue stripes and the Star of David in the middle. Israel is a true democratic country and they have declared the "right of return", that every Jewish person, no mater where he lives in the world, is also automatically an Israeli citizen. He or she is always welcome. Israel is a very proud and strong country, very powerful for its small size and has excelled in every field, and are contributing tremendously to science, technology, electronics and medicine and the list goes on and on. So you see, it wasn’t all in vain. Yes, I know it was a very high price to pay, but who can understand G-Ds workings. Hopefully some day the true meaning of all this will reveal itself and we might better understand." "But for now, we must say goodbye and I know that some day we will all meet in a much better place. Even though we must depart now, you are in my thoughts. You are always close to my heart. As we say our goodbyes I remembered that." My sister Lola explained to me where she buried her in-laws after the raid in the Bochnia Ghetto. All five members of the Lieber family are in the same grave, but there is no marker. So I walked over and said Kadish, (a prayer for the dead). A very interesting observation was made by my granddaughter, Robyn. She pointed out to us that right over my parent’s headstone there was this huge tree spread above the monument with 11 major branches and there were 11 bodies buried under it. Also, over Lola’s in-laws unmarked grave, where 5 members of the Lieber family were buried, there was a tree with 5 huge branches shading that area. Strange phenomena, indeed. From the cemetery we continued to the Salt Mine in Wieliczka. My son-in-law, Michael is physically challenged and often uses a wheelchair so we arranged for a private tour with an English speaking tour guide. We were taken down via elevator, which is usually not done. Most people climb down over 700 steps. The place is absolutely amazing. It’s much too much to describe. It would take up too many pages. However, I can highly recommend it. If you are ever around Krakow, it is a must see. On the way back, we past Plashov and stopped at the memorial. Plashov was the camp where Schindler had the factory, a notorious place for many atrocities have occurred there. By this time it was late in the evening and we returned to our hotel rooms, freshened up a little and then walked down to Sukienice Town Square. After a beautiful family dinner in this romantic outdoor café , complete with a 3 piece orchestra, wine, beer and fine dining. We topped the night off with assorted ice cream cones. They sure beat any we can find in the United States.